Kingsman fans! We have a fun giveaway for you of some swag being used to promote the film – these items were handed out during the Kingsman: The Golden Circle panel at SDCC 2017. 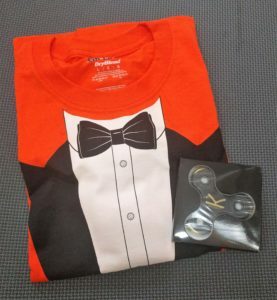 Enter now if you’d like to win a t-shirt version of Eggsy’s catchy Orange suit (Large) and a Kingsman branded fidget spinner, because yes, that’s a thing they made. You have until Tuesday, 26th September at 8pm PT to enter when we’ll randomly select our winner. * Because of the prohibitive cost of shipping abroad, we regret that this contest is only available to ship in the United States, but if you want to hire a service that’ll forward it on to you, we’re fine with that (you’ll have to search for one for yourself and just give us an address where it’s going).